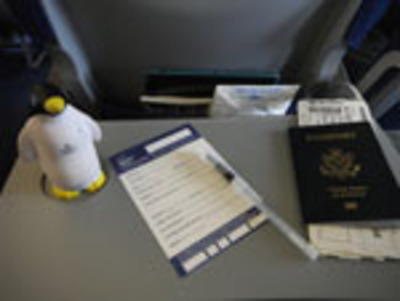 Pierre the Penguin, an unofficial Governors State University mascot, posed on an airplane tray table with a customs form, pen, and passport. The photo was featured in the article "A Penguin in London Town" on pp. 1, 2 of the August 30, 2012 GSU View as part of a Take Pierre on Vacation contest.